This Alignment Toe Bar offers a way to easily measure Toe In AND Toe Out quickly at the track. This system allows for faster measurements than a typical string system and is offered at a fraction of the cost. Throw away your strings and upgrade your racing operation - you will not regret it. 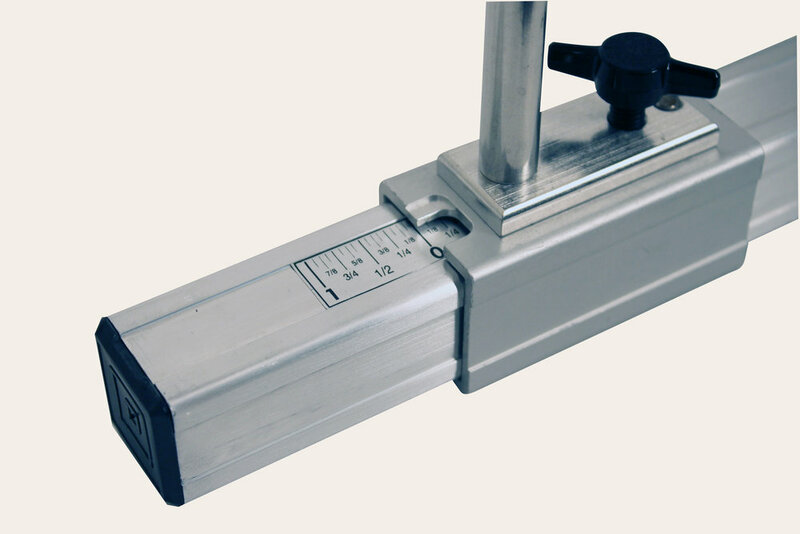 This toe measuring device allows you to measure toe in 1/16th inch increments and is adjustable to up to a 70 inch width! The Toe Bar allows you to make toe adjustments easily without needing help from another person. Yes, you can do it yourself! This is an extremely popular at-track alignment set up across all areas of racing including, dirt oval, asphalt oval, racing (both production cars and low formula cars), exotic cars, high performance driving vehicles and more! All products are accompanied with comprehensive instructions for both assembly and use. Click here for a link to purchase the tire scribe. On the slider or pointer with the slot, position the mark to zero and place the pointer in the center of the corresponding tire's scribe line (in front of the tire). Tighten the clamp to keep the gauge in this position. On the other end, loosen the clamp and slide the pointer so it lines up with the scribe mark created during Step 1. Make sure both sides are lined up with the scribe line before moving on. Move the Toe Measuring Tool to the rear of the tire. Make sure the pointers are angled towards the tire. Make sure to position the tool in the same orientation as it was when measuring the front (Step 2). In other words, the pointer that measures the left side on the front of the tire should also be used to measure the left side on the rear of the tire. Position the end of the Toe Bar without the measuring tape in the center of the scribe mark. Now go to the other side of the car and see where the pointer with the measuring tape lines up. If the pointer is aligned with the mark made by the Tire Scribe, then you have zero toe. If not, loosen the fastener and slide the pointer so it is in alignment with the scribe mark. It is important to make sure that the non-measuring side remains in the center of the corresponding scribe mark when doing so. After aligning both pointers, the measuring tape will read your toe measurement. Note: If the measurement reads wider at the rear than the front, then you have toe-in. If the measurement reads wider at the front than the rear, then you have toe-out. Make your adjustments and check the toe again by repeating Steps 1, 2, and 3. Production marks made in your tires can be used as scribe marks. If your tires do not have these lines, a scribe mark must be made.